BJ Bridge ( BriJ for short) is a unique duplicate bridge bidding and playing game for Apple iPhones, iPads and Android devices including Kindle Fire. Look out for more symbols on these pages. BriJ is designed both for beginners and those who know a bit about the game. There's copious help at every stage. 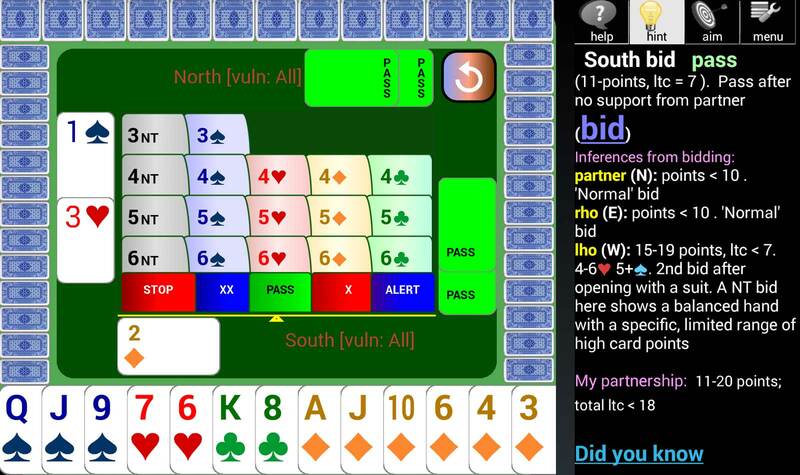 If you decide to turn on hinting, there is guidance and detailed explanation for each bid and play of the cards, whether it's you or the computer playing the cards. There are two free versions. BriJ Lite follows a Benjaminised Acol style of bidding, conforming in the main to the "Bridge for All" method recommended by the English Bridge Union. Another version of BriJ, designed for beginners to the Acol style of bidding is Duplicate Bridge Beginner. This is based around the English Bridge Union Foundation Level. ▶ Acol - Absoulte beginner; Foundation level for EBU students; Level 2 for EBU students, Advanced ACOL (with many added conventions). BriJ is optimised for the type of device you are using, whether Android tablet or mobile phone. Layouts change automatically in the mobile mode to fit in with limited screen space. 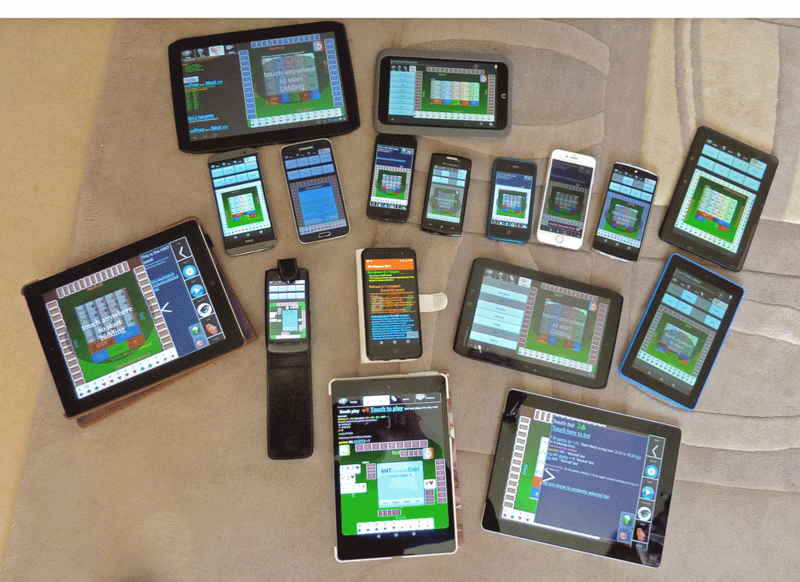 This example shows BriJ running on various android devices with varying operating systems: iPhone 4, iPhone 5, iPhone 6, iPad 2, 10.1 inch Motorola Xoom 2 tablet, Nexus 7, 8.2 inch Motorola Xoom 2ME tablet, Nexus 4 (4.7 inch) and Nexus 5 (4.95 inch), galaxy S4 (5 inch), San Francisco II (3.5 inch) Nook (7 inch). It also shows some of the varying layouts you can choose to play the game. If you have bluetooth you can connect up with other players to practice bidding and playing as a partnership. If your partner wins the contract you get the option to play in defence (against your partner) or to play the contract at the same time and independently of partner. Connect with bluetooth and play anywhere, without Internet access! Experienced club players can download hands from their club website (when using BridgeWebs). BriJ will then include double-dummy results if shown on your club site, as well as individual pairs results actually achieved. You can replay the hands against BriJ opposition to find out where you went wrong! BriJ bidding and BriJ playing engines use the same logic as real human players. You have a reasonable chance of beating your computer opponents, because BriJ does not cheat by peeking at the hidden cards to find that impossible play! Like a real player, BriJ will improve all the time. Look out for later releases! There is plenty of tutorial material to help you get used to the BriJ game and its many option settings, both within the game and on this website (see User Guide, Bridge Beginners and FAQ). Please use the Support page to leave feedback on things that you like/dislike, suggestions for future BriJ releases and to provide details of any problems you find.